A San Francisco based company, Crave Bakery sells wholesale gluten free baked goods to dozens of food stores in California and the southwest. 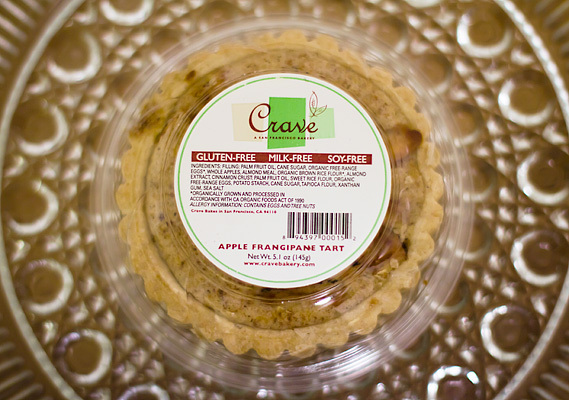 Featuring a multitude of specialty baked goods, Crave Bakery seems to own the market on pre-made gluten free desserts at bay area grocery stores. The small apple tart pictured above was purchased at Rainbow Grocery and it turned out to be quite the little dessert for two. Just a step down from a homemade pie, the crust tasted buttery despite the item being “milk free”. At around $4.99 for an item like this, I wouldn’t add it to my weekly grocery list, but it’s great to know that in a pinch I can pick up a quality gluten free dessert at my local grocery store.